pages from beth: Nailing The Gingham Trend for £7! Gingham, it's a trend that appears time and time again. If I'm honest, usually, when I see it I brush it aside and tell myself it's not a trend that interests me. However, this year it appears to be bigger and badder than ever. Not only is it in the usual black and white colours but I'm seeing it in blue, in red and it's really changed my opinion. So when I was having a look through sheinside one day I came across this cami and although I was still hesitant I thought how could I not at least give it ago for the steal price of £7 (well ok, £7.17 - but lets be honest the added 17p is nothing!) It doesn't break the bank at all and I get to dabble and pretend I'm up to date with all the trends flying around! Not to mention I have a soft spot for a relaxed peplum look since this top and so I knew it'd be a shame not too. And guys, for £7 the quality is pretty damn good! I was worried it'd actually be too big and not have any shape to it. But there is no need to worry about it falling too low and showing your dignity and the peplum really is relaxed! It's totally swayed me to the trend now and with the weather we had that was amazing (and I hope returns) it sure would keep me cool and looking stylish still! Anyone noticed my espadrilles, do they remind you of a certain designer? Well say hello to my Chanel espadrille dupe and the best thing about them? They were £12! Pretty good huh? I love them, there is something about the contrast of a really pale pink with a black toe front. If the weather perks up again these will not be leaving my feet! Ok, I could talk about this outfit forever! 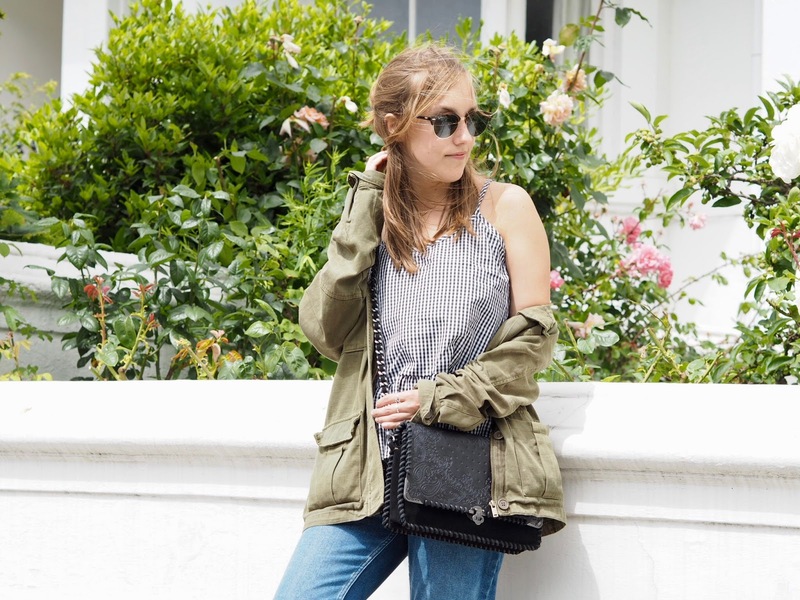 We have the top, the Chanel dupe espadrilles and even my new favourite pair of jeans and my new favourite jacket! I had been on the hunt for a pair of new jeans for ages. I'm board of skinny jeans, don't get me wrong I'm no where near converted to flares but something with a looser fit is perfect! I loved the idea of a distressed hem also but didn't want any other rips on the jeans (picky right?) But when I saw these I didn't care there was a ripped knee I loved them and they have ticked all the boxes! Who knew New Look was the place for jeans! Finally, the jacket. I had wanted a military-esque jacket for years but never took the plunge because I thought they didn't seem *cool*. However, when I saw EJStyle pose with this jacket I was so ready to get my own and actually got the same one as her! It's such a difference to wearing a denim or leather jacket all the time and it's just so perfect for summer! I wear it all the time and I'm so happy to finally have one in my wardrobe! 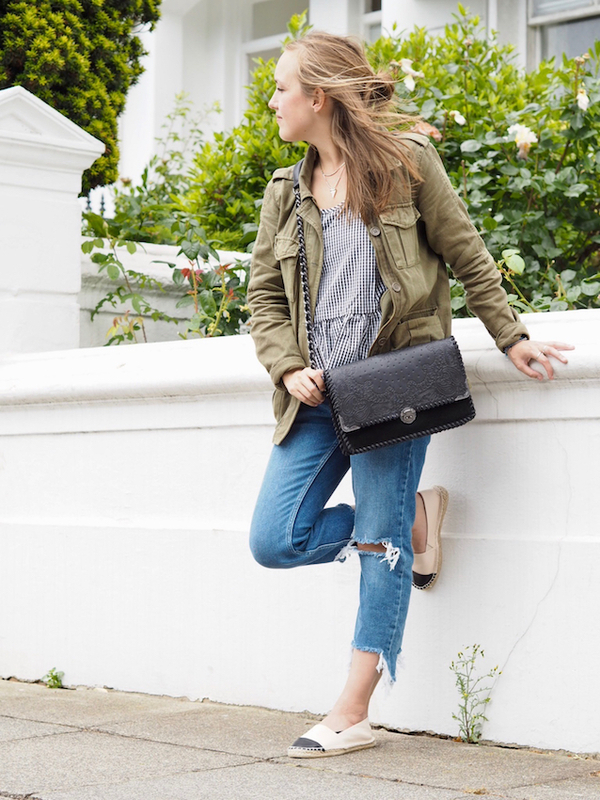 There you have it, the outfit of a few of my newest and favourite purchases all in one! Maybe I should do a haul! What is a trend you are unsure of but kind of want to try? I am not a person that really follow a trend.. but you nail this one indeed! This outfit looks great on you! Awesome post and beautiful photos!